Fanciest Dorothy and Tin Man Costumes Ever! To say that my 4-year-old son, Henry, is obsessed with the Bowser villain from the Mario Bros. video games would be an understatement. 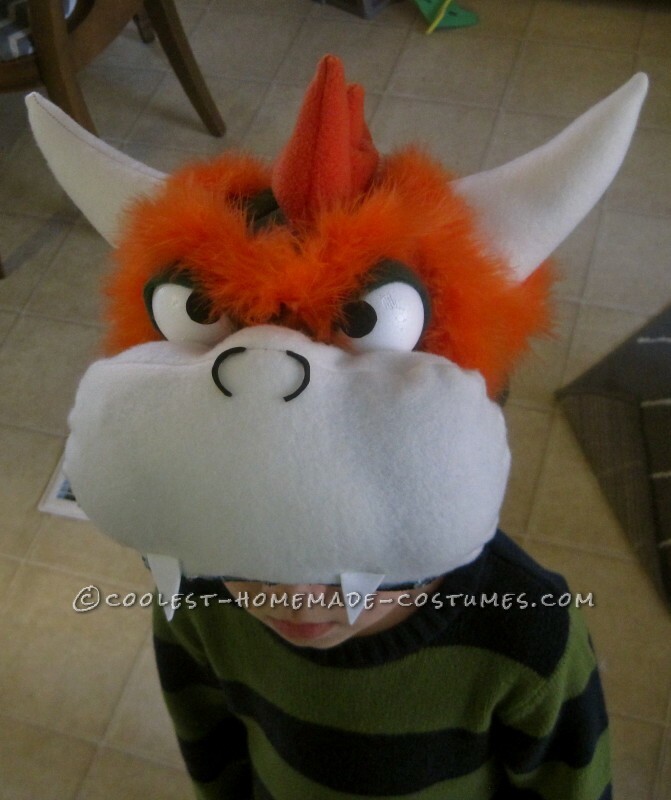 So, it was no surprise when he told me several months ago that he wanted to be Bowser for Halloween (hey, at least he gave me ample notice!). 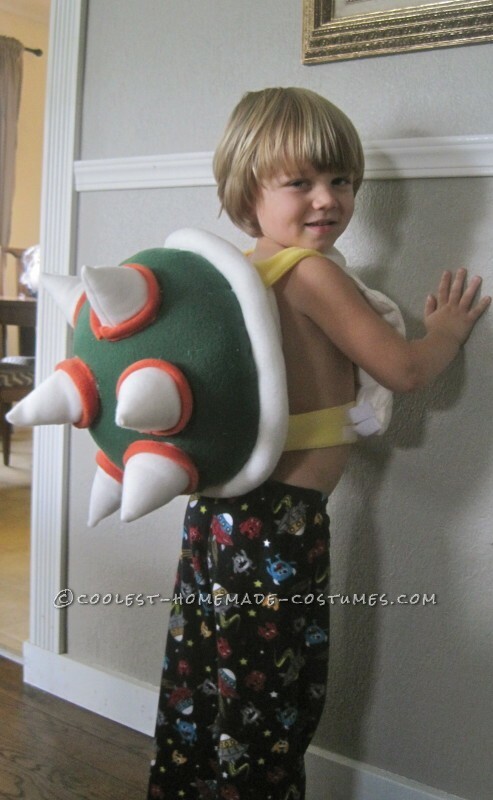 At first I gently tried to suggest that he be Mario instead… to which he replied, “But MOM! Bowser has SPIKES and shoots FIREBALLS!” so I knew there was no contest. Bowser it was. 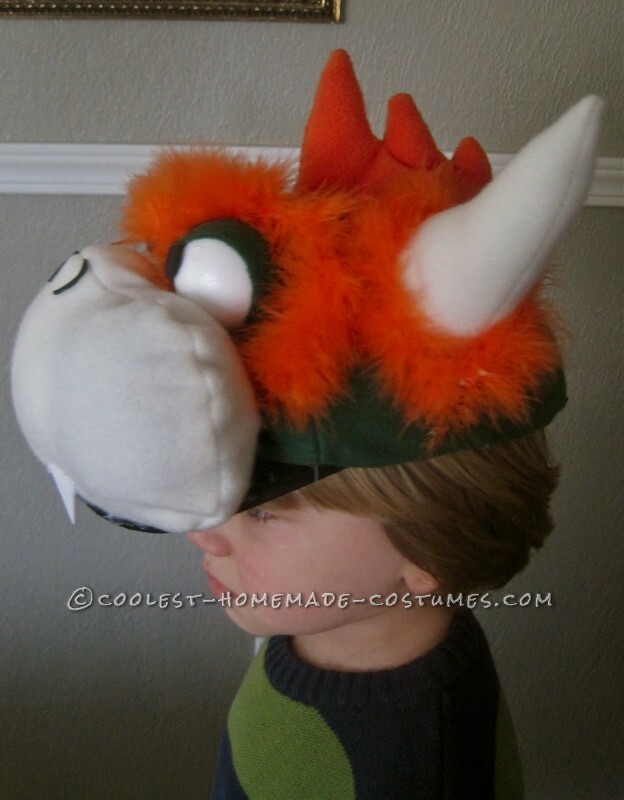 There is not a commercial “Easy Bowser Costume Pattern that Can Be Assembled with Glue & Magic” out there, so I set to work figuring out the easiest and most comfortable way for my active son to be a villain covered in spikes. We live in Seattle, so Halloween can be a bit chilly around here. I decided that fleece would be a warm and budget-friendly option. So I had my son help me pick out some good Bowser colors at the local fabric store. I was originally going to just use fleece for the hair and eyebrows, but found some fantastic maribu feathers in the right shade of orange! I grabbed some foam balls used for flower arrangements to use as the eyeballs, and pleather and some silver studs for the armbands. Now it was time to figure out a pattern. I needed something my son could easily get out of if “nature called” so I opted for a 2-piece design with shirt and pants. I used a pair of his pajamas to help with a pattern for those. Next was the shell, which I wanted as a separate piece in case he got too hot or wanted to rough-house with friends. I sewed a quilted front piece of the shell and attached it to the back via 4 strips of fleece with Velcro that he could easily slip on and off over his head. I decided on soft fleece “spikes” on the back as well so nobody would lose an eye in the dark trick-or-treating. 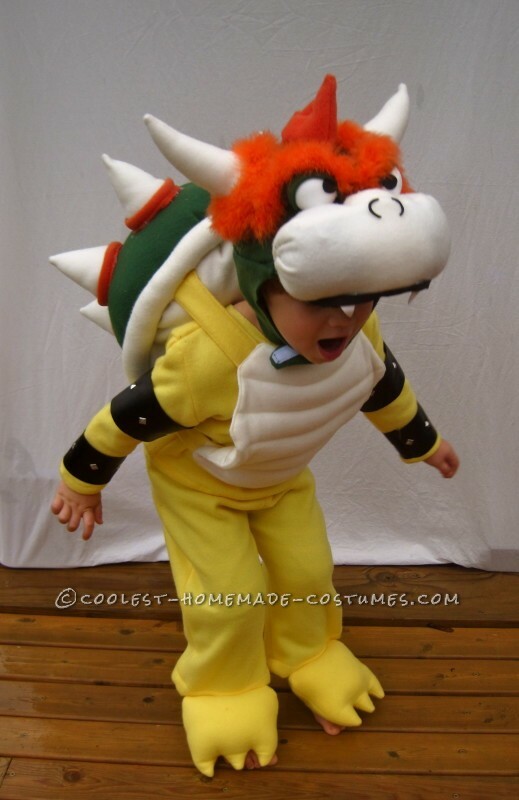 A trip to the emergency room on account of Bowser spikes would certainly be a buzz-kill. The headpiece was definitley the biggest challenge. I was originally going to use a bike helmet, but it just seemed too bulky for my son to deal with. So I built the head on top of a cheap baseball cap instead, then added fleece that Velcros under the chin to keep it in place. It took a lot of failed attempts, but I finally was able to finesse the fleece into an acceptable Bowser face with furious eyeballs and fiery maribu hair. Today, my son was finally able to try his costume on for the first time. He looked in the mirror. The exuberant and awe-struck expression that spread across his face made the 20+ hours I had spent totally worth it! 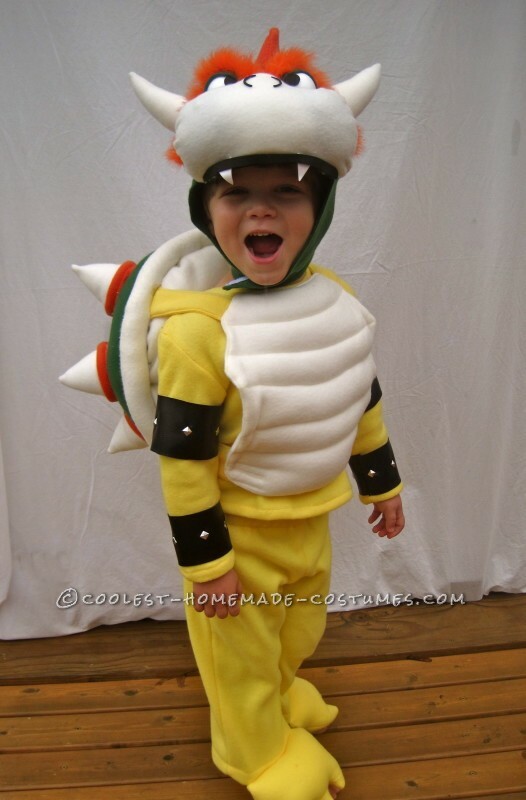 His smiling cheers and laughter were a hilarious juxtaposition to the villainous Bowser costume he was wearing! Now, I am on to finishing the homemade Mario & Luigi costumes that my husband and I will be donning tomorrow. I can’t wait to trick-or-treat together! 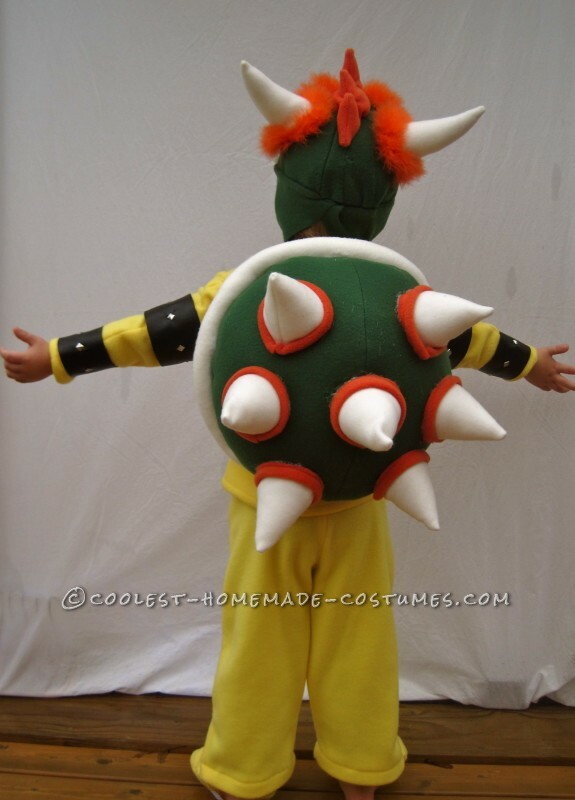 I’ve made many costumes, but my son’s Bowser outfit is the one I’m most proud of! He’s going to be a hit at his preschool party tomorrow!